El Colectivo Macondo spent two days studying with our teacher Veronica Chavez in Teotitlan del Vallle, one of the many small towns of traditional artists outside of the city of Oaxaca, Mexico. 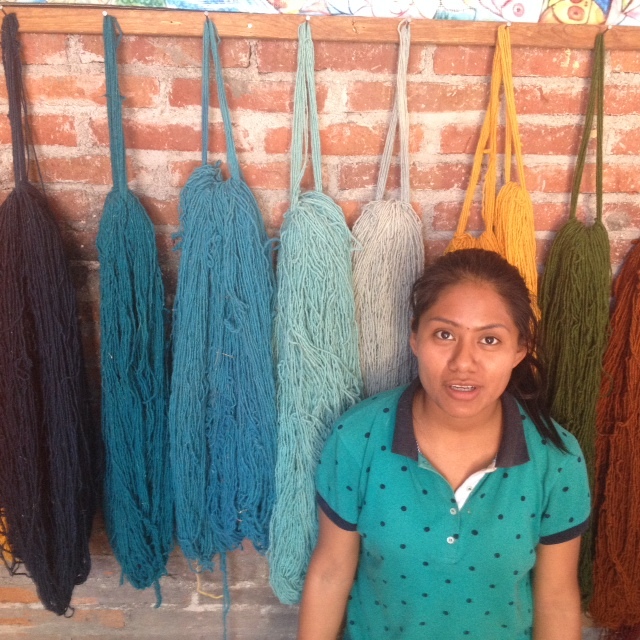 Veronica is a textile artist who follows the traditional Zapotec practices of weaving and fiber dyeing. We worked in the family studio where Veronica, her father, sister, and three brothers all practice the textile arts in their home in the town of Teotitlan del Valle. The entire second floor of their home is dedicated to the work with 7 giant treadle looms and a traditional stove for creating a dye pot. First, Veronica taught us about the natural materials she uses for dyeing wool and cotton. She uses alfalfa for green, cochineal for red, bougainvillea petals for purple, marigold petals for yellow, and indigo for blue. We learned about the alchemy of using other elements in the dyepot to shift the tones of the colors. We created a dyepot of cochineal, made of the body of an insect that is a parasite of the nopal (cactus) plant. 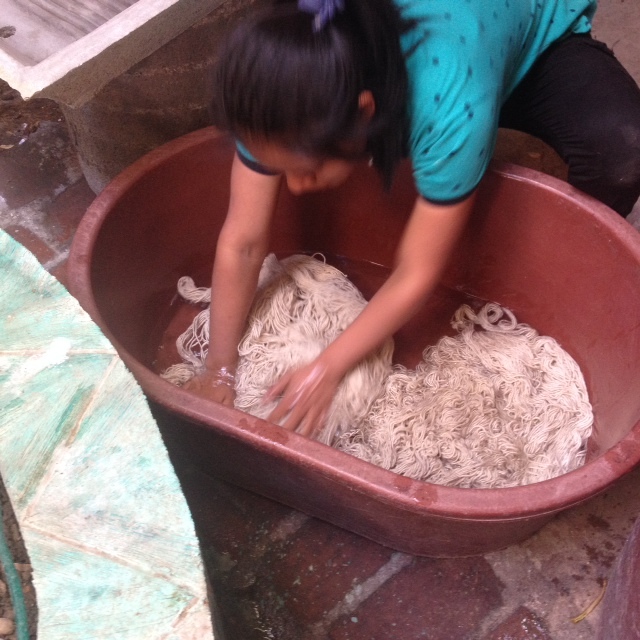 We learned that in order for cochineal to set, the dyepot must boil intensely and vigorously. As we worked, we talked about how the processes of the dyes and boiling the fiber in the dyepot could inform our Multimodal processes in our work with our clients. On our second day in Teotitlan del Valle, Veronica taught us to weave on the treadle loom which was a powerful and embodied experience. Shifting the peddles using the feet created a force felt through the ankles, knees, hips and spine that I experienced as grounding. Working rhythmically shifting the pedals as I worked watching the “tapete” – the traditionally woven piece grow shifted my attention away from my day to day concerns or worries and I was drawn fully into the transformative process. After we worked, we talked about how aspects of the dyeing and weaving practices included metaphors and components that will inform our Multimodal work with our clients and in our communities. 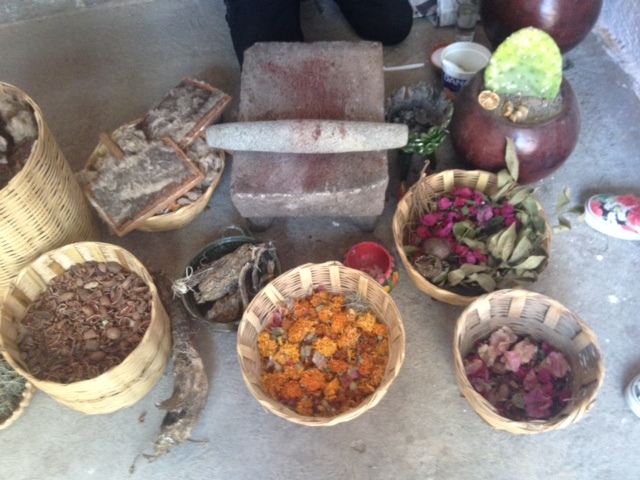 Day Two: Veronica will teach us about the natural materials used to create the colors used in the traditional practice of weaving Tapetes (traditional rugs) such as indigo, cochineal, alfalfa, and marigold petals. We will practice the alchemy of shifting and transforming the colors using traditional, natural, chemical processes and will create a dye pot and dye yarn to take home for our own knitting, weaving, and crochet projects. 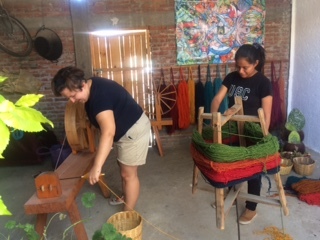 Day Three: Veronica will teach us weaving on a floor treadle loom and each of us will weave a small woven piece to hang on the wall or make into another object. Day One: Our teacher Veronica Chavez will lead us as we hike in the majestic hills of her town, Teotitlan del Valle as we collect the natural materials we will use for dying organic yarn. Throughout the workshop we will discuss and practice Multimodal processes inspired by our fiber work. Cost: $250 for three days including materials and transportation to and from Teotitlan del Valle from our hotel. Each participant will dye approximately 2 lbs. of organic wool yarn to take home for projects. For Expressive Arts students, you will earn 18 Multimodal contact hours. Our hotel will be the Oaxaca Real, $46 per night double occupancy. Please send a note or call with questions.